Researchers at the University of Southampton have cast doubt over established explanations for certain behaviours in pulsars – highly magnetised rotating neutron stars, formed from the remains of supernovae. Mathematicians have used complex modelling to examine data for one particular pulsar which exhibits both ‘glitching’ and ‘wobbling’. They found accepted theories which explain these phenomena conflict with one another – meaning they can’t fit together to explain what is happening in the star. Findings are published in the journal Physical Review Letters. A pulsar emits a rotating beam of electromagnetic radiation, which can be detected by powerful telescopes as it sweeps past the Earth, rather like observing the beam of a lighthouse from a ship at sea. They rotate at extremely stable speeds, but occasionally they suddenly speed up in brief events described as ‘glitches’. Pulsars can also spin at a slight angle so that their axis traces a cone shape, rather like the movement of a rugby ball which has been thrown slightly off balance – ‘wobbling’ at each end as it moves through the air. Lead researcher Dr Ian Jones commented: “There are a number of different theories around what causes pulsars to glitch and wobble. Some centre on the interaction between superfluid in a star’s core and its crust – others suggest gravity from an orbiting planet is pulling the star back and forth. 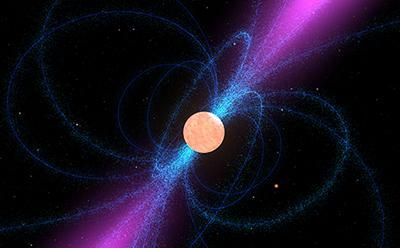 The researchers from Mathematical Sciences at the University of Southampton, UK and the Max Planck Institute for Gravitational Physics, Hannover, Germany, studied data on the pulsar PSR B1828-11. The star was discovered by Jodrell Bank in the UK in the in early 1990s and lies around 10,000 light-years from Earth in the constellation of Scutum. 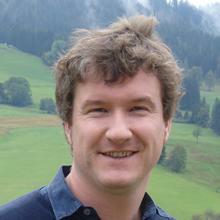 Professor David Ian Jones is Professor of Mathematical Physics within Mathematical Sciences at the University of Southampton.